Refer to the earlier post Beauty and emotions-kinship between them, which dealt with positive emotions. Now let us have a look at a few negative emotions. Anger: Anger is one of the most harmful emotions. Expressing anger is crucial to health and happiness. Anger can affect any part of the body and mind. Tension is caused by repressed anger. It produces headaches, respiratory disorders, skin troubles, arthritis and even prolonged illnesses. 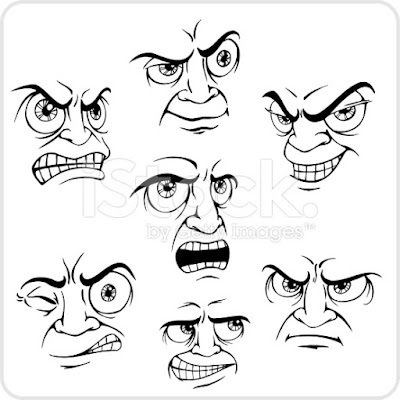 Anger produces high blood pressure, skin rashes, ulceration, colitis and depression. Research shows that women who suppress anger are more prone to develop breast cancers, than those who show their anger. Get rid of excess anger by physical activity and think whether anger is justified. Active sports are an excellent release for anger. Increased communication also helps to avoid anger. Hobbies such as gardening, painting etc. are outlets for repressed hostility. A person however good-looking he/she may be, if given to anger shows an unsightly face. Guilt and fear: The feeling of guilt can make a person torture oneself with recrimination. Guilt is a major cause of stress and causes all diseases related to stress. Fear has become a way of life these days- a fundamental human fear is the fear of the unknown. Fear is an unpleasant emotion caused by awareness to danger. A strain is placed in the whole body by fear. We fear criticism and rejection by others. We feel worried about our health, environment, violence in the surroundings, etc. Our fear about our health makes us sicker. Sometimes our fears are unfounded. Certain fears are based on myths and superstitions and others on the wrong perception about life and people in general. Boredom: Not having many interesting and responsible things to do makes a person experience boredom and it can damage health. If you enjoy the work that you are doing and also engage in other activities and hobbies, then you are never bored. If a young educated housewife has nothing to do other than looking after the kids and doing routine household work is bound to get bored. She needs something outside her home, to keep her interested. If your work is not appreciated also then it can be boring. Boredom is dangerous- It can cause heart trouble, skin problems and depression. To avoid boredom, you have to take up some hobbies or an exciting pastime. Sadness: It is the feeling of unhappiness. We are tragically sad when we lose the ones we love most. We feel sad, when we do not get what we want. Children cry when they are sad, and adults control their tears. But shedding tears provides us with a genuine physical release. If that is stored inside you, your body retains unwanted chemical wastes, which affect our health in the long run. Loneliness also makes a person sad. Praying to God also helps sometimes. To keep oneself healthy and beautiful one has to cultivate one’s positive emotions and control negative emotions. See also: Cultivate inner beauty with better mental health / Laughter, the best medicine / Inner Beauty / Sense of humor-tips to regain it / Self-esteem- Why is it so important? What I've learned is that you have to shower love on your negative emotions. Learn to love/accept both the good emotions and the negative ones. Then the negative ones will have no power over you b/c hypothetically speaking all they want is for you to give in to them and turn sour.. There are four things we can do with emotions. Represses them suppress them, express them and confess them. Take anger for example. If we repress or suppress anger it will come out eventually in and unhealthy explosion of anger, and that of course is expressing your anger. The forth thing is to confess your anger or negative emotions. You can do that to the person that hurt you or betrayed you or to someone else who is a good listener. Good listeners are hard to find because they will listen and be empathic and be supportive without judging you or the person that hurt you. They focus on your feelings. Be that as it may, if you confess you feelings to the person that hurt you it will be important to do so in an adult way, not a childish angry blaming way. For example: "I was really hurt when you went to bed with my mom on our anniversary." You are saying what you felt and what happened to make you feel that way. If at all possible the statement should be made without the word "you" in it. I couldn't figure out how to do that in this statement.